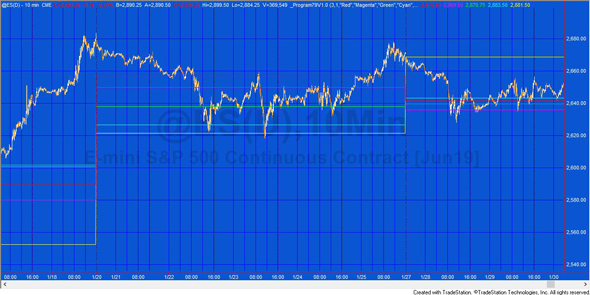 Program 79 estimates horizontal support and resistance lines based on the chart’s volume profile for the previous week. 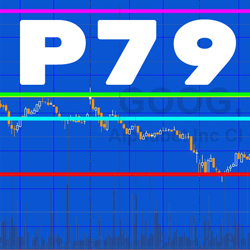 The theory underlying program 79 is that if significant volume has occurred at a specific price level then, perhaps, that level have some significance as a level of support and/or resistance. Similar programs include program 56 and program 78. Program 79 analyses data over the last week. Program 78 analyzes a user defined number of bars starting from the last completed bar on the chart and counting backwards. Program 56 analyzes all the bars on a chart (after maxbarsback). Program 79 is available for immediate download for $94.95. The download is a TradeStation ELD file that includes the unprotected and commented program. This program will not work in MultiCharts because it uses the TradeStation collections and other functionality that is not available in the MultiCharts environment. The code underlying the storage of previously calculated values in an XML file, may have applications in other projects that you are interested in that are very data and calculation intensive. At the end of each week the volume profile is stored in a dictionary for that week. The closing price (converted to a string) is used as the index and the sum of volume for bars closing at that price is stored as the value. At the end of each week the program counts back through the week and populates the volume profile dictionary by examining each bar. If there is not an index in the dictionary for a specific closing price, the closing price (converted to a string) and the volume are added to the dictionary. If the closing price is found in the dictionary, the volume of the newly found bar is added to the volume for this price. See the ‘spreadsheet analysis’ video below to see a visualization of this calculation. 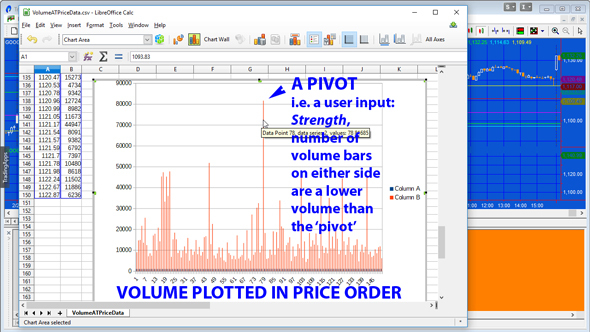 Once the volume profile dictionary is populated or updated, program 79 looks for volume ‘pivots’. Referring to the image below, to qualify as a pivot there must be a user specified number of smaller bars above the pivot and below the pivot. Once found these ‘pivots’ are stored in another dictionary (PriceVolumePivots). A vector of the keys for this new dictionary are then sorted by their volume values and the resulting price levels are drawn on the chart. The volume pivot with the highest volume is plotted using user input: Color1, the next highest is plotted using Color2 etc. If the user input Print_Dialog is set to TRUE, program 79 also prints the information in the print log. 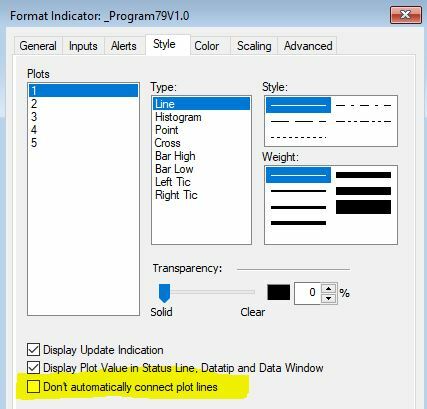 Make sure that in the plot format, “Don’t automatically join plots” is NOT selected for each of plot 1, 2, 3, 4, and 5. 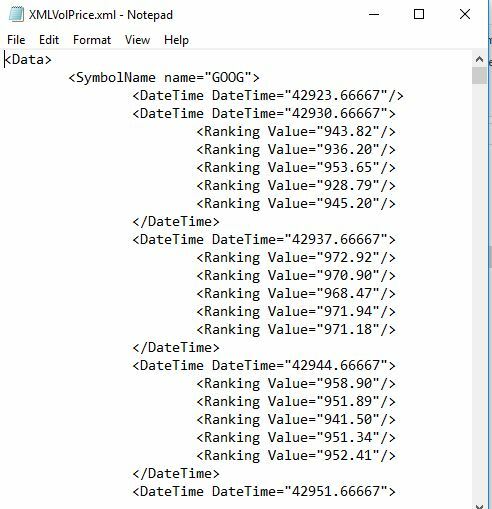 If you wish to do a recalculation for the chart, first turn the status of the program to OFF, then delete the XML file that was created previously, then turn the status of the program to ON. Print statements were added to the program to create the ‘spreadsheet analysis’ video below. These statements are commented out and are not necessary for the running of the program. They are left in the source code in case you wish to use them to do your own verification or capture other data. Please email if you find any bugs or have questions.